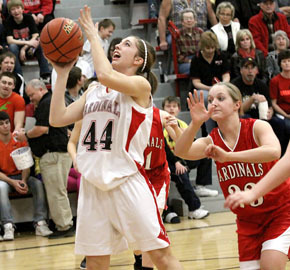 The Boone Central Lady Cardinals concluded the 2011-12 regular season the way they began. Boone Central hosted Doniphan-Trumbull in the regular-season finale Tuesday, Feb. 7, in Albion and had little trouble rolling over the visiting Cardinals 62-35. Showing no signs of fatigue from its Mid-State Conference championship game performance in Wayne the previous night, Boone Central took care of business from the opening tip, securing its #1 ranking in the Lincoln Journal-Star Class C1 Top 10 as teams begin sub-district play. “I felt like this was a really good performance by our team,” praised Cardinal Coach Mike Kennedy. “Less than 24 hours after an emotionally-draining game in Wayne, we were back on the court. We played very hard on defense and competed hard on the boards. There wasn’t much more to be said. When a team dominates offensively, defensively and on the boards, it opens the way for a 17-3 first-quarter blitz, a 27-12 halftime advantage and a 46-18 lead after three periods.